The Mark Ross Montessori Foundation (MRMF) is a non-profit 501(c)(3) entity that exists to support the Ross Montessori School. The mission of MRMF is to provide financial support the Ross Montessori School and to help the school achieve its vision. Through the Annual Fund, Capital Campaign, fundraising events and grant writing, the Foundation will grant money to the school to augment educational programs. Montessori education follows the child. Teachers create individualized, self-paced work plans for students to follow as they master skills and concepts. Teachers serve as guides, and students are encouraged to explore and discover on their own. Through this educational model, students achieve academic success as well as physical, social and emotional growth. At RMS, programming is enriched with art, drama, foreign language, outdoor education and technology. Students participate in community service. Our goal is to foster competent problem solving and to cultivate a community that embraces humility and grace in the face of everyday challenges. RMS is a charter school authorized by the Colorado Charter School Institute. As a charter school, RMS is allowed the freedom to be non-conventional and innovative while being held accountable to state standards for advancing student achievement. Because charter schools are public schools, they are tuition free (except full day Kindergarten), open to the public and do not have special entrance requirements. However, charter schools receive less funding than conventional schools. For this reason, giving to the Annual Fund is critical to the success of our charter school. The Annual Fund is our yearly appeal for donations that support an educational environment of excellent teaching and learning. The Annual Fund underwrites the many tools and activities that support a well-rounded and vibrant Montessori education. It funds our educational program directly in the following ways: classroom assistants, visual arts, performing arts, Spanish language, and technology. The state of Colorado ranks 35th in public school funding, and charter schools like RMS receive 20% less funding than other public schools. WE BELIEVE OUR CHILDREN DESERVE MORE. Every dollar you give to the Annual Fund goes directly to make up this difference. PARTICIPATION IS KEY. High participation shows the broader community that we believe in our school and strengthens the school’s position when applying for grants, loans and other external funding. OUR GOAL IS TO HAVE 100% PARTICIPATION FROM OUR STAKEHOLDERS AND FAMILIES OF STUDENTS ATTENDING ROSS. In 2016-2017, our average gift was $483, representing a wide array of individual donations. Any donation, no matter the amount, is welcome and critical to our success. BY MAIL Send your gift to Mark Ross Montessori Foundation, 109 Lewies Lane, Carbondale, CO 81623. RECURRING GIFT Consider making a monthly or quarterly donation processed automatically. Spread your donation over the course of the year. SECURITIES/STOCK TRANSFER Contact Tricia Williams, Development & Enrollment Director, see below. MATCHING GIFTS Check with your employer to determine matching gift availability and program terms. There are many ways you can make the dollars you already spend go further for Ross. 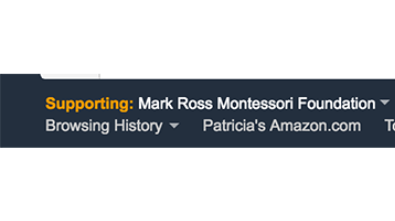 Set up your account with Amazon Smile at https://smile.amazon.com/ and choose Mark Ross Montessori Foundation as the organization you support. Then, each time you shop, make sure you see Mark Ross Montessori Foundation and you know a percentage of your shopping will come to Ross. iGive.com is totally free. Stores include: Amazon.com, Pottery Barn, REI, Staples, Petco, Expedia, Best Buy, QVC and many more. Best of all, up to 26% of your purchase at each store is donated to Ross. Clean out your closets and donate your gently used (no stains, tears or pills) clothing and household items (no chips and in working order) to local consignment shops. Give them the Ross Montessori account number and when your item sells, the consignment comes to Ross! Write Ross Montessori School on the packages you drop off. Your gift is deductible to the extent allowable by law. the Mark Ross Montessori Foundation is a 501 (c) (3) tax-exempt organizations. Tax ID # 20-2556775. When our community gives, people outside our community will give. We are looking for 100% participation from families, staff and board members. Help us get to our important goal. $100,000 for the Ross Montessori School Annual Fund pays for the assistants in the classrooms; buys Montessori materials; provides program enrichment with visual art, performing art, Spanish, technology and physical education. Learn more about our Annual Fund. SCHOOL DAYS from AmeriGas Propane will give our school up to $2,000 per school year for books and computers, equipment, Montessori materials, and anything else we need. SAVE your AmeriGas Propane receipts and bring them to school to deposit in the School Days Receipt Box ... It's just that easy.